Chinese President Xi Jinping shakes hands with President Trump during a joint statement in Beijing last November. Rather than a frontal assault on U.S. leadership, Xi has articulated his vision of a "community of shared destiny." 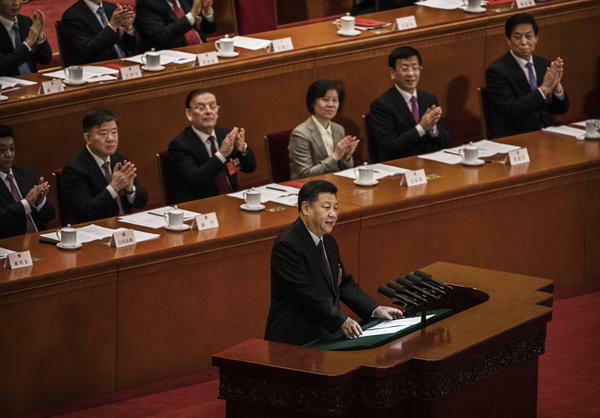 Xi, seen speaking to the National People's Congress in Beijing, is working to reform international institutions and norms to reflect the interests of the Chinese government. To date, however, Xi has avoided taking the United States head-on in competition for global leadership. There is little evidence that he desires the responsibility such leadership entails; the world has yet to hear, for example, a Chinese proposal to meet the challenge of global terrorism, the refugee crisis or even climate change. Xi's approach instead has been to work to erode the foundational pillars of U.S. leadership — its alliances, the values and norms upheld by international institutions and its development model — and supplant them with ones more supportive of Chinese interests. 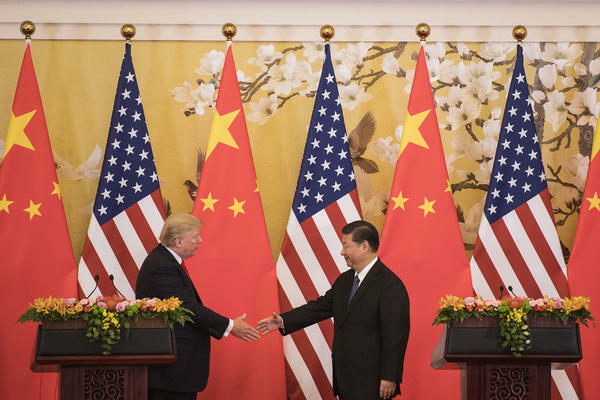 In this context, the U.S.-China trade conflict might be understood as merely one battle in a protracted ground war over values, principles and global leadership. In the current global balance of power — sustained by both the relative distribution of global wealth and the system of U.S.-led alliances — the United States remains the dominant player (although less so than at any time in the recent past). Rather than a frontal assault on U.S. leadership, Xi has articulated his vision of a "community of shared destiny," which is premised on mutual cooperation, fairness and equality — a "new" approach that "supersedes" an outdated Western model. While benign-sounding, this community concept means nothing less than the end of the U.S.-led system of alliances. As one Chinese official told me, such alliances are "anachronistic" and "not suitable for the contemporary time." The shaky commitment of President Trump to America's alliance structures has provided welcome support to Chinese diplomats and scholars tasked with selling Xi's idea. Nonetheless, the Chinese leader has undermined his own soft sell with his military assertiveness in the South China Sea and willingness to adopt coercive economic policies toward South Korea and Taiwan, among other nations. Xi also is working to reform international institutions and norms to reflect the interests of the Chinese government. Beijing's diplomats are adeptly exploiting the United Nations and other organizations to try to diminish the relative weight of individual freedoms and liberties in human rights discourse and promote Internet sovereignty, as opposed to the free flow of information. China's grand-scale Belt and Road infrastructure initiative has become a test case for the norms underpinning China's development path, which discount the importance of good governance in pursuit of rapid economic development. While many countries eagerly court Belt and Road projects, many others are now rejecting them, fearful of the potential negative environmental, financial and social ramifications. Finally, China has dramatically increased the resources it puts toward public diplomacy, providing generous scholarships for foreign students and officials to study the China model, opening government-sponsored centers to advance understanding of Chinese language and culture, and launching a media campaign to shape the Chine narrative. Officials in some developing countries appreciate China's emphasis on infrastructure-led growth, foreign investment and political stability. The Tanzanian minister of transport and communications found China's censorship practices worthy of emulation: "Our Chinese friends have managed to block such media in their country and replaced them with their homegrown sites that are safe, constructive and popular. We aren't there yet, but ... we should guard against their misuse." In addition, Beijing is not only advancing its own positive China narrative but also moving to prevent others from providing a contrary one. After a Chinese company took a significant stake in a South African newspaper, for example, a writer found his column canceled after publishing an article criticizing China's repression in the Western autonomous region of Xinjiang. And in Kenya, the Chinese government subsidized digital television access for 800 villages, providing extensive Chinese programming while ensuring that other international stations, such as the BBC and Al Jazeera, were priced out of reach. Some Chinese analysts now boast about the positive relationship between "not free" political systems and economic prosperity. The United States should not fear the China model or Xi's promotion of it. It is not, in the end, an inherently resilient or attractive system. The environmental, health and demographic challenges are well-known. There are serious and rising levels of household, corporate and government debt. And ongoing protests from many sectors of society — including feminists, workers, students, pensioners and retired members of the military — suggest deep pockets of discontent. As one European China scholar has noted, "Never have I seen such a successful country in which so many people who benefit the most all want to leave." Yet neither can Washington afford to ignore Xi and his efforts to remake the international system. The administration needs to give life to its concept of a free and open Indo-Pacific: an affirmative message of the values inherent in liberal market democracies and a demonstration of those values at home, buttressed by a set of robust political, economic and security partnerships, and a commitment to international development premised on these principles. If the best the United States can do is complain, whine, and denounce China, it most certainly will lose not only the battles along the way, but also — and more importantly — the war. Elizabeth Economy (@LizEconomy) is director of Asia studies at the Council on Foreign Relations and distinguished visiting fellow at the Hoover Institution. Her most recent book is The Third Revolution: Xi Jinping and the New Chinese State.